Ganga is one of the major rivers of the Indian subcontinent, flowing east through the Gangetic Plain of northern India into Bangladesh. The 2,510 km (1,560 mi) river rises in the western Himalayas in the Uttarakhand state of India, and drains into the Sunderbans delta in the Bay of Bengal. 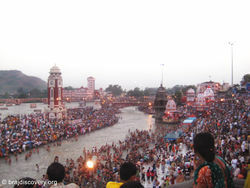 It has long been considered a holy river by Hindus and worshiped as the goddess Ganga in Hinduism. In heaven she is known as Alaknanda, and in hell or Patal as Vaitarni. Ganga is the daughter of Himvan by his wife Mena. She had been brought down to earth by Bhagirath, great-great-grandson of king Sagar, to wash the ashes of the 60,000 sons of Sagar. Pleased with Bhagirath's austerities, Brahma promised to let Ganga come down to earth, but first Bhagirath would have to convince Shiv to take the force of the falling water before she came down, as the earth could not bear the force of the river. Bhagirath performed penance to please Shiv, and Shiv agreed to receive Ganga on his head. Ganga, arrogant of her power, came down rushing, planning to carry Shiv with her to Patal. Shiv understood her plan, and to teach her a lesson blocked her passage by trapping her in his matted locks. Bhagirath had no choice but to propitiate Shiv, whereupon the deity shook her out of his matted locks. Bhagirath and Ganga travelled a long distance together. On their way they had to pass the hermitage of sage Jahnu. The waves of the Ganga, flooded the hermitage. The furious sage drank up the waters of Ganga. The gods pleaded with the sage to let Bhagirath taste the fruit of his austerities, and then Jahnu let her out of his ear. Soon Ganga was on her way again and led by Bhagirath, she also went to Patal, via the ocean, where she purified the dead sons of Sagar with her waters. Once, the Vasus, cursed by Vasishth to be born on the earth, came to Ganga and begged her to beget them and destroy them immediately, so that they could return to their world. Ganga agreed. She soon married king Shantanu on the condition that she would stay with him as long as he did not question her moves, however horrifying her act may be. The king agreed. Ganga gave birth to the eight Vasus one by one, and every time a child was born she would throw it into the river. The king, silenced by his vow, could not do anything about it. *When the eighth child was born, the king could not bear it any longer and stopped her from killing the child. Ganga took the child with her, when she disappeared. When the child was later returned to his father, he was a skilled archer. The child was called Devvrat alias Bhishma. Ganga is also considered to be the mother of Kartikeya. This page was last modified on 2 March 2010, at 13:17.